At the outset of his career, Thomas Cole, considered the founder of North American landscape painting, produced picturesque views of the Hudson River. Expulsion. Moon and Firelight marks a shift of direction towards an allegorical type of landscape. The central motif is a bridge suspended over a great drop, which the artist saw in the White Mountains in New Hampshire in 1827. Starting with this element, Cole made use of his imagination to create the setting for the Expulsion of Adam and Eve (neither of whom are actually present). The composition is symmetrically structured around the cross shape created by the waterfall and bridge. On the right is Paradise and on the left the world after the Fall. The pronounced contrast between the glowing light inside the arch and the shadow around it emphasises the sublime character of the scene. Cole feared the effects of the rapid industrialisation of the United States and here depicts the North American landscape as a metaphor of Eden. “The whole landscape, which, seen by a favourable light, and in a genial temperature, had been found so lovely, appeared now like some pictured allegory of life, in which objects were arrayed in their harshest but truest colors, and without the relief of any shadowing [...], the bold and rocky mountains were too distinct in their barrenness, and the eye even sought relief, in vain, by attempting to pierce the illimitable void of heaven, which was shut to its gaze by the dusky sheet of ragged and driving vapor.”High-flown descriptions of nature like the above can be found in The Last of the Mohicans by James Fenimore Cooper, who chose the American wilderness as the ideal setting for his heroic story of Indians in colonial America. 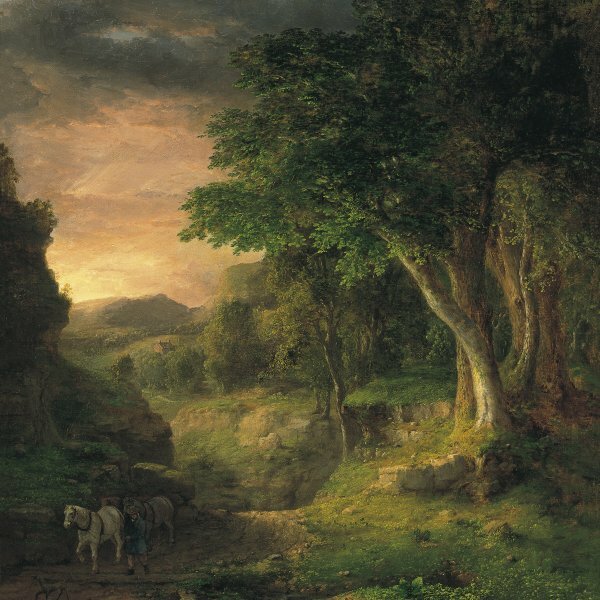 In 1826, the same year it was published, the painter Thomas Cole produced several Landscape Scenes from “The Last of the Mohicans” conveying a new vision of the American scenery, inspired by his travels through the rocky formations of the White Mountains in New Hampshire. These works are a precedent for the new, higher style of landscape that Cole employs in paintings such as the Museo Thyssen-Bornemisza Expulsion.Moon and Firelight. Cole no longer viewed landscape painting as merely descriptive but as a vehicle for expressing religious or moral meanings, God’s power over nature and man’s defencelessness towards it. Expulsion. 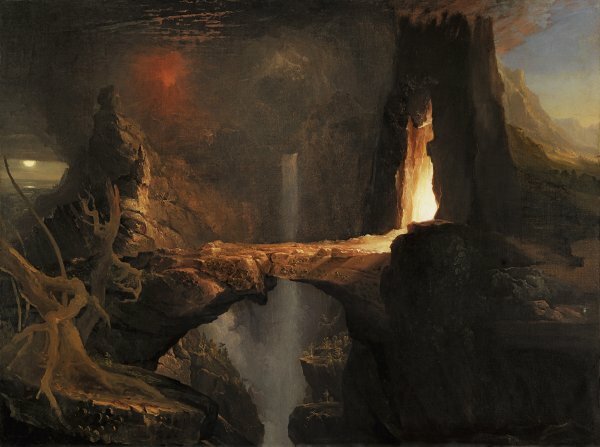 Moon and Firelight is likewise linked to two works on biblical themes that Thomas Cole exhibited in 1828 at the National Academy of Design in New York and which, as Franklin Kelly has studied, 1 changed the course of his career as a painter: The Garden of Eden and Expulsion from the Garden of Eden. The Fort Worth Garden of Eden depicts the world before the fall and the composition is dominated by an idyllic landscape never before seen. In the Expulsion in the Boston Museum of Fine Arts, Adam and Eve, after being expelled from Paradise, cross a rocky bridge towards a tumultuous natural environment. Cole drew inspiration for the bridge that marks the division between the world of paradise and wild, chaotic nature from a landmark in the White Mountains called “the Bridge of Fear, ” which had attracted his attention during a trip to these parts and featured in numerous drawings in his previous year’s sketchbook. Both the figures of Adam and Eve and the depiction of Paradise have been removed from the Museo Thyssen-Bornemisza Expulsion, a painting full of paradoxes. The landscape and the elements of creation — the stone bridge, the waterfall, the volcano and the moon — are the only features of the scene. As Kenneth W.Maddox points out in his study of the painting, Cole divides the composition symmetrically by means of the cross formed by the horizontal line of the bridge and the vertical line of the water of the cataract and at the same time establishes a symbolic interplay of contrasts between moonlight and daylight, the fire of the volcano and water, and earth and air, which belong to the aesthetic of the sublime. Both the Boston painting and that in the Museo Thyssen-Bornemisza evidence the influence of the engravings made by the painter John Martin for an edition of John Milton’s Paradise Lost. The mark of the English painter is found not only in the craggy gateway but, in particular, in the use of light to afford the composition dramatic force.